All we know about him is a name written on a glass negative: ‘Hart’. Ever since I first saw him I have kept his photograph on my wall. He has been the inspiration for many hours of image research for the World War I film that screens in Te Papa’s C20th history exhibition, Slice of Heaven. Using silent archive footage and stills the film tells the story of the journey of New Zealanders who served on the Western Front. More than 12,000 New Zealanders died on the Western Front. 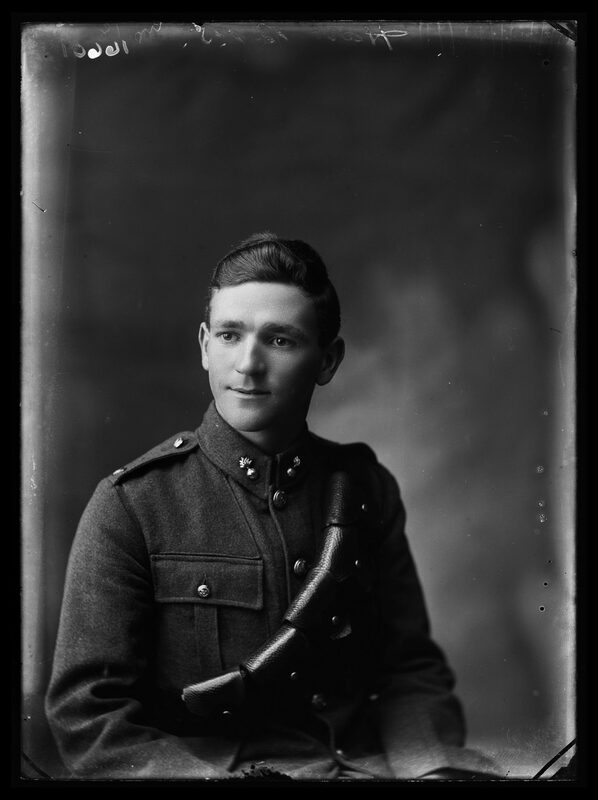 More than 800 men died in a single day at Passchendaele in Belgium.Hart was just one of thousands of New Zealanders who had their portrait taken for loved ones before they departed for the war. Te Papa has a large collection of them, mostly unidentified apart from a surname. You can search them here at Collections Online. Sons, brothers, husbands, lovers, fathers, uncles, grandfathers…who loved them? Who kept their photographs? The man in the photo is my maternal grandfather, Alfred Hart. I have his wedding photo with his bride, Hilda Queenie Dixon, but this is the first time I have seen this particular photo – very likely taken on the same day – 19 April 1918. He served as a Gunner overseas and thankfully for his family returned home safely, returning to his work as a compositor. He was a true gentleman. That’s so wonderful! Thank you for this valuable information. One of the Berry Boys project team will be in touch with you in the next few days to follow up on some details. You can find out more about the research project here: http://www.tepapa.govt.nz/berryboys. Prue, your post is so sad – one feels so much for the families and the young men who never returned. Keep on caring for them.